Any reason for the split tooth? Using the kitbots 3/16" nutstrip to hold it all together. The split tooth is purely aesthetic. The overall shape of the disk is somewhat skull-like, so I figured I'd give it teeth. This and the drum kit bot will be my first tests using the 4-40. I used the 6-32 in Motor City Massacre and from what I can tell, they took absolutely no damage, but looked rather huge in the chassis. With Algos, it's wrapped in 1/16 and 1/32 ti, so it should be rather springy and good at absorbing impacts, so I think they'll be plenty for the application. I'm using TinyESC's, these aren't the Kitbots 1000rpm motors that are for sale, they're motors that are being tested for a 1lb Kitbots kit. No idea on amps, but probably quite low as they're 030 motors. I was running 3s in the test video, the bot will normally operate on 2s. well as some home anodized titanium. Unnamed (so far), built with a friend of mine locally, his first bot. Weapon is a servo powered front hinged flipper. Klazo, Julie's bot, main upgrade is a new, somewhat less unbalanced drum with a bit more spinning mass. The flipper under the name Reptar to go with my friends Chuckie costume at Dragon*Con won the 1lb class. Apollyon went undefeated and won the 12lb class. Nyx lost it's first match, then went on to win the 30lb class. We got a ton of video which will be showing up once it's ID'd and converted to a smaller/faster to upload format. initial build, some redesign, shaft hardening and titanium anodizing. That thing looks pretty sweet. Dragon Con Robot Battles is next weekend, and after some more tweaking on a few of the robots and a few new builds/rebuilds, the fleet is ready. Nyx and Apollyon have been essentially untouched since their post Motorama repairs and upgrades. Gelos (the one with the massive wheels) is a new build from almost entirely scrap parts. 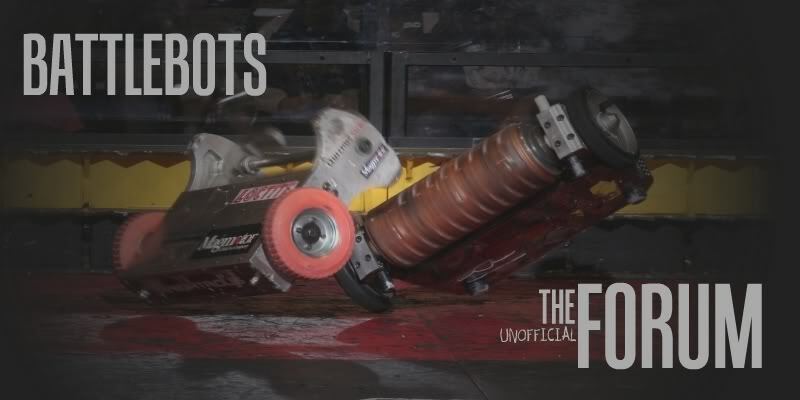 Algos has had its wedge freshly sharpened after going undefeated at Clash of the Bots. Klazo has a new, larger, faster drum and some new side rails and wedgelets to match. Reptar is a full rebuild of last years 1lb Dragon Con Robot Micro Battles champion. There are 93 videos total and as of posting this 17 have uploaded so they should trickle in all night. Algos, Apollyon and Nyx won their respective classes.